gravitational waves during a black-hole collision. The discovery has major implications for science. People around the world cheered yesterday morning (Feb. 11) when scientists announced the first direct detection of gravitational waves - ripples in the fabric of space-time whose existence was first proposed by Albert Einstein, in 1916. The waves came from two black holes circling each other, closer and closer, until they finally collided. The recently upgraded Laser Interferometer Gravitational Wave Observatory (LIGO) captured the signal on Sept. 14, 2015. Not every scientific discovery gets this kind of reception, so what exactly is all the hype about, and what's next for LIGO now that it has spotted these elusive waves? First of all, detecting two colliding black holes is thrilling by itself - no one knew for sure if black holes actually merged together to create even more-massive black holes, but now there's physical proof. And there's the joy of finally having direct evidence for a phenomenon that was first predicted 100 years ago, using an instrument that was proposed 40 years ago. But what is truly monumental about this detection is that it gives humanity the ability to see the universe in a totally new way, scientists said. The ability to directly detect gravitational waves - which are generated by the acceleration or deceleration of massive objects in space - has been compared to a deaf person suddenly gaining the ability to hear sound. An entirely new realm of information is now available. "It's like Galileo pointing the telescope for the first time at the sky," LIGO team member Vassiliki (Vicky) Kalogera, a professor of physics and astronomy at Northwestern University in Illinois, told Space.com. "You're opening your eyes - in this case, our ears - to a new set of signals from the universe that our previous technologies did not allow us to receive, study and learn from." "Up until now, we've been deaf to gravitational waves," LIGO Executive Director David Reitze, of the California Institute of Technology (Caltech), said during an announcement ceremony in Washington, D.C.
"What's going to come now is we're going to hear more things, and no doubt we'll hear things that we expected to hear … but we will also hear things that we never expected." With this new sensory view of the universe, here are some of the things scientists hope to discover. 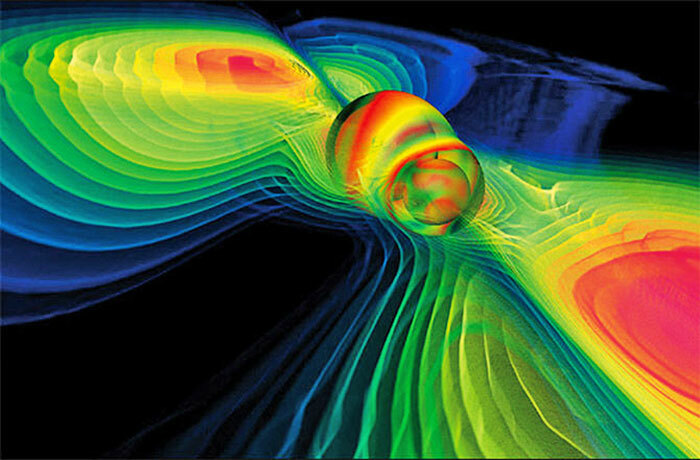 LIGO is particularly sensitive to gravitational waves that come from violent cosmic events, such as two massive objects colliding or a star exploding. The observatory has the potential to locate these objects or events before light-based telescopes can do so, and in some cases, gravitational-wave observations could be the only way to find and study such events. that stretch and squeeze space-time. See how gravitational waves work in this Space.com infographic. For example, in yesterday's announcement, scientists reported that LIGO had identified two black holes spinning around each other and merging together in a final, energetic collision. As their name suggests, black holes don't radiate light, which means they are invisible to telescopes that collect and study electromagnetic radiation. Some black holes are visible with light-based telescopes, because material in their immediate vicinity radiates, but scientists haven't seen examples of merging black holes with radiating material around them. In addition, the black holes spotted by LIGO are 29 and 36 times the mass of the sun, respectively. But David Reitze said that as LIGO's sensitivity continues to improve, the instrument could be sensitive to black holes that are 100, 200 or even 500 times the mass of the sun that are further away from Earth. "There could be a really nice discovery space that opens up once we get out there," he said. Scientists already know that studying the sky in different wavelengths of light can reveal new data about the cosmos. For many centuries, astronomers could only work with optical light. But relatively recently, researchers built instruments allowing them to study the universe using X-rays, radio waves, ultraviolet waves and gamma-rays. Each time, scientists got a new view of the universe. In the same way, gravitational waves have the potential to show scientists totally new features of cosmic objects, LIGO team members said. "If we're ever lucky enough to have a supernova in our own galaxy, or maybe in a nearby galaxy, we will be able to look at the actual dynamics of what goes on inside the supernova," said LIGO co-founder Rainer Weiss of MIT, who spoke at the announcement ceremony. "gravitational waves come right out [of the supernova], boldly unimpeded," Weiss said. "As a consequence, you really find out what's going on inside of these things." A teaspoon of neutron-star material would weigh about a billion tons on Earth. Scientists aren't sure what happens to regular matter under such extreme conditions, but gravitational waves could provide extremely helpful clues, because these waves should carry information about the interior of the neutron star all the way to Earth, LIGO scientists said. LIGO also has a system set up to alert light-based telescopes when the detector seems to have spotted a gravitational wave. Some of the astronomical events that LIGO will study, such as colliding neutron stars, may produce light in all wavelengths, from gamma-rays to radio waves. With LIGO's alert system in place, it's possible that scientists could observe some astronomical events or objects in various wavelengths of light, plus gravitational waves, which would provide a "very complete picture" of those events, Reitze said. "When that happens, that'll be, I think, the next big thing in this field," he said. Gravitational waves were first predicted by Einstein's theory of general relativity, which was published in 1916. That famous theory has stood up to all kinds of physical tests, but there are some aspects that scientists haven't been able to study in the real world, because they require very extreme circumstances. The extreme warping of space-time is one example of this. "Until now, we have only seen warped space-time when it is very calm - as though we had only seen the surface of the ocean on a very calm day, when it's quite glassy," Kip Thorne of Caltech, another founding member of LIGO and an expert on warped space-time, said at yesterday's ceremony. "We had never seen the ocean roiled in a storm, with crashing waves. All that changed on Sept. 14. The colliding black holes that produced these gravitational waves created a violent storm in the fabric of space and time." "This observation tests that regime beautifully, very strongly," Thorne continued. "And Einstein comes out with beaming success." But the study of general relativity via gravitational waves is far from over. Questions remain about the nature of the graviton, the particle believed to carry the gravitational force (just like the photon is the particle that carries the electromagnetic force). And scientists have many questions about the inner workings of black holes, which gravitational waves may help illuminate (so to speak). But all of that, the scientists said, will be revealed slowly, over the course of many years, as LIGO and related instruments collect more data on more events. Looking toward the next three years, Reitze said the collaboration is focused on increasing LIGO's sensitivity to its full potential. This will make the observatory - which consists of two big detectors, one in Louisiana and the other in Washington state - more sensitive to gravitational waves. But scientists don't know how many events LIGO will see, because they don't know how often many of these events occur in the universe. caused by passing gravitational waves. LIGO detected the binary black hole merger even before the instrument began its first official observation campaign after its recent upgrade, but it's possible that this was a lucky break. To get the gravitational astronomy train rolling, LIGO simply needs more data. "When Einstein predicted general relativity, who would have predicted that we'd use it every day when we use our cellphones?" he said. (General relativity provides an understanding how gravity influences the passing of time, and this information is necessary for GPS technology, which uses satellites that orbit further away from the gravitational pull of the Earth than people on the surface). LIGO is "the most sensitive instrument ever built," said Reitze, and the technological advances that have been made while building the observatory may feed into technologies that will be used in ways people can't yet predict. Kip Thorne said he sees the larger contribution of LIGO slightly differently. I think we would all agree it's great art, great architecture, great music," he said. "Similarly, when our descendants look back on this era, and they ask themselves, 'What great things came to us?' … I believe there will be an understanding of the fundamental laws of the universe and an understanding of what those laws do in the universe, and an exploration of the universe," Thorne added. "LIGO is a big part of that. The rest of astronomy is a big part of that. And I think that cultural gift to our future generations is really much bigger than any kind of technological spin-off, than the ultimate development of technology of any kind. I think we should be proud of what we give to our descendants culturally."